The first Rhythm at the River 'supper club' sessions were held in the summer of 2012 at the 400 year old River Tea Rooms by the River Great Ouse in St Ives, Cambridgeshire. 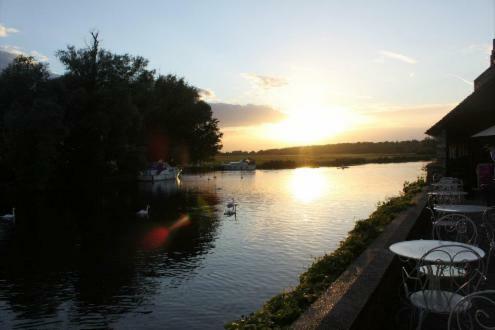 In 2013 we added another excellent riverside venue, the 400 year old Pike and Eel Hotel and Marina, which is a beautiful and scenic location in the village of Needingworth, Cambs. In 2014, we added a further two venues to host the Rhythm at the River gigs. The Dolphin Hotel, which is situated on the opposite side of the River Ouse in St Ives to the River Tea Rooms and The Old Ferry Boat Inn in Holywell who hosted our gig in May. Avalon Event Support www.avaloneventsupport.co.uk bring some amazing experienced touring musicians to the town of St Ives. Supporting them are some of Cambridgeshires’ best up and coming performers. We also have local young photographers/film-makers and artists involved so they can use the events as a platform to showcase their talent: www.facebook.com/rhythmattheriver. All shows may be subject to change at short notice due to circumstances beyond our control.